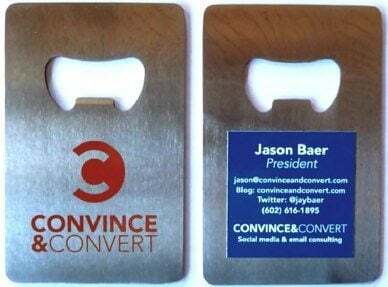 In honor of South by Southwest, home of ironic T-shirts, and cool business cards, I had a special edition of my Convince & Convert cards made. Why should business cards just sit there? Why can’t they serve a higher purpose? In this case, that purpose is to open bottles. Ideally, you won’t associate Convince & Convert solely with whatever liquids the bottles in question contain, but either way I hope these cards have a shelf life. If you’re going to be at South by Southwest interactive, come find me and I’ll give you one.